Truman Mobile is the official mobile application of Truman State University. Truman Mobile allows users to follow the latest University news and events. Students can check their grades and class schedule, find an available computer and much more. Visitors can also use it to navigate campus. Specific features include: Truman Master Calendar events; Truman Today stories; Truman Index stories; Truman’s YouTube channel; department blogs; campus map; current class schedule; grades for past semesters; library catalog search; and a Truman faculty, staff and student directory search. More features will be coming soon. Truman Mobile works with iOS and Android devices and is available for free on Amazon and the Google Play Store. To see screen shots of Truman Mobile, or to download installation instructions, visit m.truman.edu/app/docs. Truman Mobile was designed by Truman alumnus Huan Truong and current student Prasang Chhetri. Truong worked for IT Services full time after graduating in December 2011 until recently leaving for graduate school. Chhetri is currently a student worker for the IT Services Web Services team. Truong and Chhetri also received support from IT Services staff and other members of the campus community. Feedback or questions can be sent to mobiledev@truman.edu. A Kirksville story is the basis for a Hollywood movie, “The Possession,” which opened nationwide Aug. 31. “The Dibbuk Box,” published by Truman State University Press, documents local resident Jason Haxton’s experiences with an old wine cabinet believed to be haunted. Haxton purchased the cabinet on eBay after he heard about it from a Truman student. The eBay auction caught the attention of a wide audience, including a Los Angeles Times reporter who wrote an article about the various owners of the box, which was noticed by movie producer Sam Raimi. In 2004, Raimi’s lawyer approached Haxton for rights to make a movie about the item that had become known as the dibbuk box. While finally agreeing to movie rights, Haxton kept rights to publish a book about his own experiences with the box, which he was recording in journal entries. “The Dibbuk Box” was published by Truman State University Press last November to coincide with the original Halloween release date for the movie. The movie was delayed, but the book has been rising in popularity as the release of the movie nears. The book is available in print or digital editions at local bookstores and online at tsup.truman.edu. In the Washington Monthly September/October 2012 magazine, Truman State University is recognized as the No. 6 master’s university in the nation. Truman is the only Missouri school listed in the top 50, and the only public Missouri school on the entire Top 100 Master’s Universities list. Washington Monthly bases its rankings on three criteria: social mobility, which gives colleges credit for enrolling low-income students and helping them earn degrees; research production, with particular emphasis on schools where undergraduates eventually earn Ph.D.s; and commitment to service. More information about the rankings can be found at washingtonmonthly.com/college_guide/rankings_2012/masters_universities_rank.php. In addition to the Washington Monthly, Truman recently was recognized by the Princeton Review and the Fiske Guide to Colleges. The Princeton Review’s publication “The Best 377 Colleges, 2013 Edition,” is based on student-conducted surveys. The “Fiske Guide to Colleges 2013” evaluates public and private colleges by cost and academics. Truman was on their list of 41 schools, 20 public and 21 private, as a best buy. Truman is the only Missouri school included on the Best Buy list. The annual Kirksville Regional Air Festival will take place Sept. 9. Gates open at 10 a.m. with the Air Show scheduled for 2 p.m. Admission is $10 per person. Kids five and younger are admitted free. Tickets can be purchased at the gate or in advance at the Kirksville Area Chamber of Commerce. This year’s Air Fest features the United States Army Golden Knights Parachute Team. They will jump at the beginning and end of the Air Show. They will also jump into Stokes Stadium to begin the Bulldog football game at 6:30 p.m. Sept. 8. Other performers include Gary Ward, Bob Richards, Erik Edgren, Aaron Taylor and Team Aerostar. The United States Air Force is sending two A-10 Thunderbolts to perform a Heritage Flight with a P-51 Mustang. Helicopter rides will be available for $40. There will also be a free kid’s zone with inflatables as well as several food vendors. For complete information, visit the Air Fest website at www.kvairfest.com. There are many opportunities to volunteer at the Air Fest and volunteers are admitted free. To volunteer, contact Randy Smith, Air Fest director, at kvairfest@live.com. 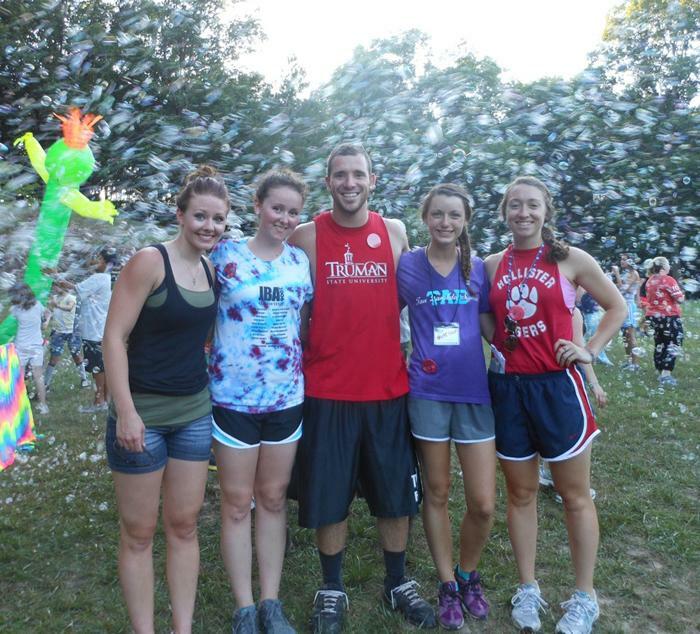 Truman State University companions Kaitlin Stump, Jacquelyn Wheeler, Andy Mundwiller, Belinda Sell and Brie Daniels, pose for a photo during Camp Quality Central Missouri’s summertime event, the Bubble Bus—a dance party for campers and staff in a raging storm of bubbles. The camp, located in St. Clair, Mo., is a weeklong summer camp serving children who have or have had cancer, and their siblings. During the week each child is paired with their own personal companion, a student, who accompanies them to events like hot air ballooning, horseback riding, and swimming. Camp Quality is a worldwide organization with various locations across the U.S.
Truman is known for having a large number of clubs and organizations. Many such organizations host informational meetings at the beginning of the academic year and at peak times, eight to 15 events will be listed each day. Information about those meetings may be found on the Master Calendar at calendar.truman.edu. If a chartered student organization or a recognized department/division/program at Truman would like to have an on-campus event listed on the Calendar, click on the “Submit an Event” button on the top right side of the Calendar or at the bottom left corner. Users can also export Master Calendar events to Outlook calendars by clicking the word “export” at the bottom of the event description page. Examples of some of the events posted on the Master Calendar this week include: Alpha Phi Omega Rush Info Meeting; Tau Lambda Sigma Dress Drive; Panhellenic Recruitment Registration; IFC Rush; Student Activities Board (SAB) Information Night; American Marketing Association Information Night; College Republican Recruitment Meeting; and Phi Beta Lambda Rush, among others. The Truman Public Relations Office has chosen Alexandria Petigna, a senior communication major and business administration minor, as intern for the Fall 2012 semester. Petigna is from Shawnee, Kan., a suburb of Kansas City, and a 2009 graduate of Mill Valley High School. She is the daughter of Alex and Noell Petigna. As intern for the Public Relations Office, Petigna will help write, layout and distribute the University newsletter, Truman Today, on campus and online. She will also assist in planning 2012 Family Day, write press releases and fulfill various office tasks. Petigna recently arrived back in the U.S. after a semester-long study abroad in New Zealand where she expanded her knowledge of Kiwi culture and explored the captivating New Zealand landscape. She is thrilled to be back at Truman to study, and is ready to continue her involvement around campus. Petigna is a member of Lambda Pi Eta National Communication Honors Society, Alpha Sigma Alpha social sorority and serves as a Zumba instructor at the Student Recreation Center. She previously volunteered as a University student ambassador. 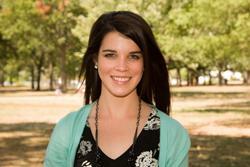 Petigna plans to pursue a career in public relations, advertising or marketing. Truman’s chapter of the National Collegiate Hispanic Honor Society, Sigma Delta Pi, has been named an “Honor Chapter” for its outstanding activities in 2011-12. This is the 19th consecutive year the chapter has received this award. Chapter advisor Lucy Lee, professor of Spanish, was instrumental in earning this honor that was awarded to only 14 chapters nationwide in 2012. Each May, all 585 chapters of Sigma Delta Pi across the U.S. are asked to submit an annual report detailing their numerous activities and projects from the academic year. Based on these reports, the National Executive Committee chooses approximately 10-15 “Honor Chapters” annually. This recognition is based upon the caliber of chapter projects that reflect the Sigma Delta Pi mission of honoring excellence in the study of the Spanish language, contributing to cultural understanding and upholding the goals of the society. 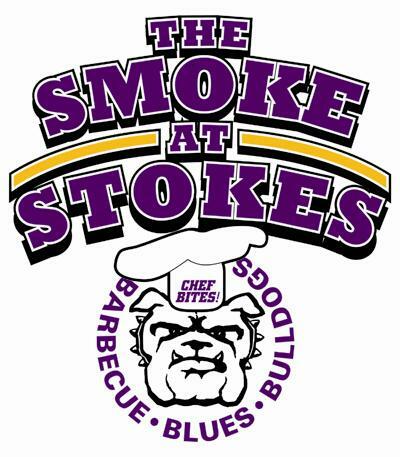 To celebrate the home opener, the Truman football team is sponsoring The Smoke at Stokes, a Kansas City Barbeque Society sanctioned BBQ competition, Sept. 8. Starting at 11 a.m., the parking lot located at the southwest corner of Franklin and Patterson streets will be the site of a state championship BBQ event. Live blues music from Deadwood will be performed between 1-3:30 p.m. with a short intermission to present the BBQ awards. Concessions will be available throughout the day. Beginning at 4 p.m. the parking lot will be opened for one of the two Truman tailgate events this season. Samples from the BBQ competition will also be available at that time. For $5 participants can taste a selection from each competitor and cast their vote for the People’s Choice award. All of this leads up to the football home opener when the Bulldogs will take on Lincoln (Mo.) at 7 p.m. As part of the pre-game activities, the U.S. Army Golden Knights Parachute Team will jump into Stokes Stadium for the National Anthem. The Golden Knights will be performing at the Kirksville Air Fest Sept. 9. General admission tickets are $8 for adults and $5 for senior citizens and those K-12. Tickets will be available at the ticket windows before the game. For more information on the Smoke at Stokes or the home opener, contact Truman Athletics at 660.785.4235 or visit trumanbulldogs.com. In response to faculty members continually looking for ways to keep abreast of advances in technology, IT Services and the Office of the Provost have joined together to purchase a subscription to a substantial collection of intensive online professional development opportunities that can be accessed from any computer. Magna Online provides an extensive cache of videos and publications that may be of interest to faculty members. These are productions based on conferences many may have wished to attend, but did not have the resources to do so. One such selection is “How to Balance Online Learner Needs and Instructor Workload” by Samantha Streamer-Veneruso and Tammy Stuart Perry. They discuss the concerns instructors have when creating an online class: have they created more work than they can handle? The pair shows the solution lies in creating a learner-centered community that encourages students to assume more of the learning responsibility while reducing the instructor’s workload. To view the video, or read the accompanying materials, log in to Magnapubs.com and type in “Stuart Perry” in the TOPICS search section. Another video, this one from Educause, is “Best Practices for Designing Successful Blended” by Veronica Diaz. This video demonstrates how to make the best of face-to-face and online instruction by designing a blended course from scratch or re-designing a traditional class. To provide feedback after viewing these videos, or for assistance in setting up an account, contact the Learning Technologies Team at 660.785.7750 or stop by PML 205. Free tickets will be available for students to pick up at the SAB Office in the Student Union Building several weeks before the performance. Tickets will also be available at the door. For more information, go to sab.truman.edu. Tickets must be purchased in advance and can be purchased online at store.truman.edu/familyday. *If a student has a meal plan, they do NOT have to purchase a meal ticket. Seating is limited so participants are encouraged to bring chairs or blankets. General admission tickets are $8 for adults and $5 for senior citizens and those K-12. Admission is free to Truman students with a Truman ID. Tickets will be available at the ticket windows before the game. For more information, call 785.4276. Come and enjoy musical entertainment provided by the Busted String Band, as well as popcorn and complimentary lemonade. The Busted String Band is an Americana band that formed at Truman in March 2011 and is made up almost entirely of current students and recent alumni. Since their birth in Kirksville, the BSB has made a reputation throughout northern Missouri and southern Iowa as a high-energy, entertaining live act. Over the last year, the members of the Busted String Band have shared the stage with a variety of nationally touring acts like Iron & Wine, Jason Boland & the Stragglers, Brandon Jenkins and many more. *The festival includes an antiques show, which will take place in the Arts Center at 117 S. Franklin. For more information, visit kirksvillearts.com. Show current Truman ID for free food. Truman’s Department of Nursing is seeking continued accreditation by the Commission of Collegiate Nursing Education (CCNE) for the Bachelor of Science in Nursing (BSN) program. An accreditation review has been scheduled in October. Interested parties are invited to submit comments directly to CCNE. Written and signed comments will be accepted by CCNE until Sept. 15. All comments should be directed to: Cristina Walcott, Administrative Assistant, Commission on Collegiate Nursing Education, 1 Dupont Circle, NW, Suite 530, Washington, DC 20036. Submit information and pictures to tmiles@truman.edu. Sept. 10 at 7 p.m.
Students will teach conversational English in public schools in rural Guangdong Province. Participants will earn credit in Chinese 550 and 12 credit hours. For more information, contact Timothy Farley at tfarley@truman.edu. The Missouri Department of Higher Education is looking for Missouri college students to grace the covers of its publications. Selected students will participate in a group session with a professional photographer in Columbia, Mo. Students’ photographs and bios will be featured on MDHE publications for the 2013-2014 and 2014-2015 academic years and other marketing efforts. All interested students should send an email by Sept. 21 to amanda.brown@dhe.mo.gov. Nontraditional students are encouraged to apply. International students are welcome to apply, however, the MDHE is fully aware they may not be eligible for compensation. High school seniors that will be attending a Missouri postsecondary institution in the fall of 2013 may also apply. A digital photo, taken within the last three months, should be attached to the email. The MDHE will accept clear photographs from professional or amateur photographers. Selected students will be notified of the time and place to meet and compensated $100 for their time. All participants will also be provided their own individual shots in a digital format. In the email, students should include the following information: name, school address, home address, phone, email, height, age, school attending, major and school activities/hobbies. Alpha Phi Omega 2012 Fall Rush informational meetings will take place Sept. 4, 5 and 6 at 6 p.m. and 6:45 p.m. in Violette Hall 1408. Attendance to at least one of the meetings is required in order to rush the national co-ed service fraternity. All Truman students are welcome to rush Sept. 9-14. For more information email kmg1513@truman.edu. Hoodies are $12, and long sleeved t-shirts are only $5. Limited quantities available; first come, first serve. 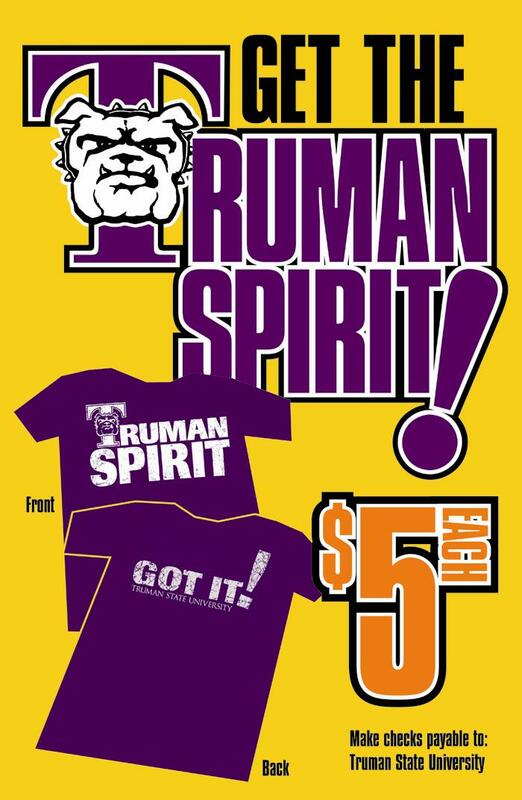 Stop by the Center for Student Involvement to purchase, or go to homecoming.truman.edu/store to buy online. All Truman State University students have access to the career services management system used here on campus. Through the Career Center website, students can access eRecruiting—an online resource designed to make their job search process easier and more targeted to their needs. Simply log in truman.experience.com using a TruView username. For questions or assistance, stop by the Career Center, Student Union Building 3100, or call 660.785.4353. An exhibit featuring the many library resources available to faculty, staff and students is currently on display in the Library Gallery. Highlighted are audiobooks, art prints, e-resources, production services, research help and much more. Come by and see what you can discover at Pickler. To make an appointment visit redcrossblood.org. The Center for Student Involvement is looking for faculty and staff members to serve as advisors for a number of student organizations that are either without a current advisor or whose advisor will be retiring soon. An interest form is available at csi.truman.edu/advisors.asp. Faculty and Staff need to renew their Truman parking decals. They may register their vehicle via their TruView home page. In the “View and Update My Personal Information” channel, in the lower right hand corner, select “Register My Vehicle.” For each vehicle faculty and staff members will need to go back to the “Register My Vehicle” link. Deadline: Fridays by 4 p.m.
All information, rules and registration requirements are online at recreation.truman.edu/intramuralrec.asp, or contact the Intramural Office at 660.785.4467. Captains' meeting is at 4:30 p.m. in the SRC Conference Room. The Bulldog football team is once again selling discount cards that may be utilized year round at more than 30 local businesses. Dog Tags may be purchased for $10 in the Athletics Office in Pershing Building, from any member of the football team or in the Public Relations Office, McClain Hall 202. Sign up for the City of Kirksville Notifications and get important information sent as text messages and emails directly to your mobile phone, wireless PDA or pager. To set up the notification system and select what messages to receive, click here. Students interested in any of these fellowships should contact Maria Di Stefano at mdistefa@truman.edu. For further information, visit gradstudies.truman.edu/fellowships.asp. Curtis R. Blakely, assistant professor in justice systems, authored entries on “Alcatraz Island Prison,” “Leavenworth Federal Penitentiary” and the “Chillicothe Correctional Center” in the Social History of Crime and Punishment in America. Adam Brooke Davis, professor of English, has an article in the current issue of “Oral Tradition” (26:2), the festschrift for the late John Miles Foley. “Vernacular Phrasal Display: Towards the Definition of a Form” studies the form and function of flamboyant comparisons (e.g., “slicker than deerguts on a doorknob”) as a type of folk verbal performance. Matthew Derezinski, associate professor of art, will exhibit his digital work “Thoughts of Perception” through Sept. 20 at Kishwaukee College in Malta, Ill. An article about his exhibit can be found at www.kishwaukeecollege.edu/press_releases/prArticle.php?id=1036. Caroline Forsythe, student in justice systems, had her entries on “Billy the Kid,” “John Augustus” and the “National Prison Association” published in the encyclopedia, The Social History of Crime and Punishment in America. Michael Goggin, professor of physics, presented a poster at the annual meeting of the Division of Atomic, Molecular and Optical Physics of the American Physical Society in Anaheim, Calif., in June. The poster, entitled “Estimation of a quantum interaction parameter using weak measurement: theory and experiment,” describes using a photonic controlled-not gate to perform an experimental test of a theory for extracting information from quantum systems with minimal disturbance of the system. Goggin also attended the American Association of Physics Teachers Workshop on Physics Laboratories Beyond the First Year in Philadelphia, Pa., in July. Thomas Trimborn, professor of music, was a luncheon speaker at the Kirksville Arts Association as a part of the “A State Divided: Civil War in Missouri Exhibit.” His topic was “Lincoln On Screen” highlighting scenes from the best screen portrayals of and references to the sixteenth president. In anticipation of Steven Spielberg’s film “Lincoln” starring Daniel Day-Lewis as President Lincoln to be released this December, numerous film clips from the silent era to the present were shown and discussed to illustrate the film and television industries fascination with Lincoln. The Student Activities Board (SAB) will conduct an information night from 6-8 p.m. Sept. 4 in the Student Union Building Alumni Room. The American Marketing Association will host an information night at 7 p.m. Sept. 4 in Violette Hall 1010. The American Marketing Association is open to all majors. College Republicans will host a recruitment meeting at 7:30 p.m. Sept. 4 in the Ryle Hall Lounge. A Physics Colloquium event will take place at 4:30 p.m. Sept. 5 in Magruder Hall 1000. Haskell Taub of the Department of Physics and Astronomy at the University of Missouri-Columbia will discuss the study of water diffusion on single-supported bilayer lipid membranes by neutron scattering. SAB will sponsor Ice Cream Creations from 2:30-4:30 p.m. Sept. 6 on the Student Union Building Mall. Students can make their own ice cream. Ingredients and toppings will be provided. The InterFraternity Council (IFC) Rush Assembly will take place from 7-10 p.m. Sept. 7 in Violette Hall 1000. For information on individual IFC events, visit the Master Calendar at calendar.truman.edu. Ekklesia will sponsor the Youth Rally “God’s Design for My Life” from 1-6:30 p.m. Sept. 8 in Violette Hall 1000. Accomplished scientists Dr. Mike Houts and Dr. Paul Rutherford will be the featured guests. Both men will assert that true religion and true science are not mutually exclusive. The Youth Rally is sponsored by the Kirksville and Martinstown, Mo., Churches of Christ. A tailgate party for Truman’s first home football game is scheduled for 6:45 p.m. at the Ekklesia Campus House. The American Association of University Professors (AAUP) will host its monthly meeting at 4:30 p.m. Sept. 11 at the University Club House, 516 E. Patterson. Contact Marc Becker at marc@truman.edu or call 660.785.6036 for more information. Panhellenic Recruitment continues through Sept. 10. For information on individual events, visit the Master Calendar at calendar.truman.edu. Alpha Phi Omega will conduct a bake sale fundraiser Sept. 11-14. Tables will be set up in the Magruder Hall cyber café, Violette Hall and McClain Hall from 9 a.m.-3:30 p.m. each day. The Study Abroad Fair will take place from 10 a.m.-3 p.m. Sept. 13 in the Student Union Building Activities Room. Students will have the opportunity to speak to other students who have studied abroad in different parts of the world. 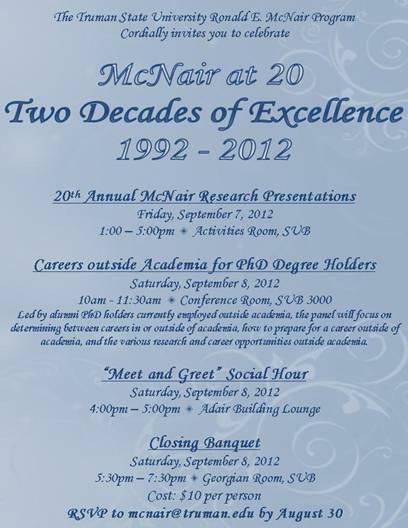 The Fourth Annual Interdisciplinary Biomedical Research Symposium will take place 8:30 a.m.-3 p.m. Sept. 29 on the A.T. Still University campus. More information can be found at atsu.edu/research/conferences_seminars.